A day and night display in hand-made, fired enamel. Having presented a trio of vintage-inspired chronometers powered by rebuilt vintage Omega movements, Barcelona-based Atelier de Chronométrie is now onto its fourth timepiece. While the earlier models featured retro-style sector and gilt dials, the AdC #4 is endowed with a striking cloisonné enamel dial that is also made in the Spanish city. Tangentially reminiscent of the cloisonné “observatory dial” on the vintage Omega Constellation de Luxe, the enamelled center of the AdC #4 is actually a day and night indicator integrated onto the baseplate, which completes a full rotation every five hours and 20 minutes. It can, however, be tweaked for a more conventional 12 or 24 hour rotation. 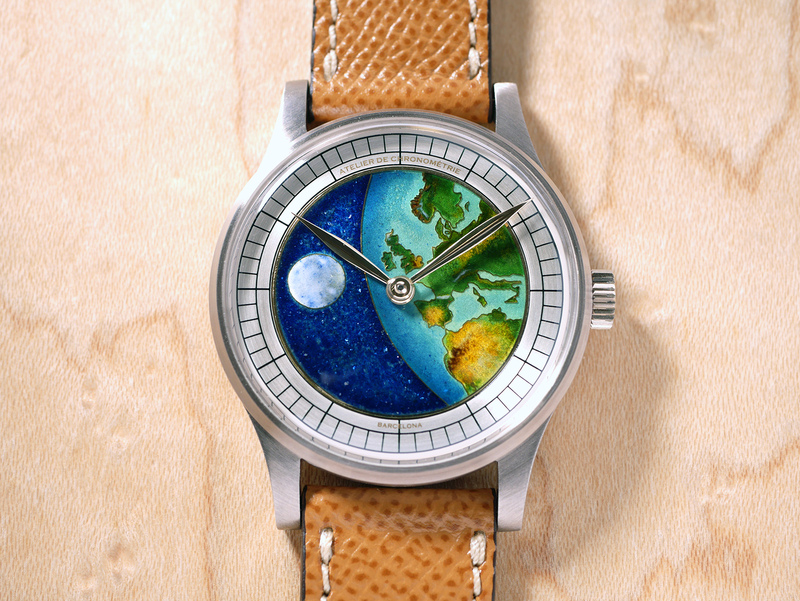 Hand-made in Barcelona by an independent enamel artisan, the dial is composed of 18k and 24k gold wires bent to form the outline of the moon and earth, then soldered into the dial base. The cells formed by the wire are then filled with mica, opaque, opalescent and transparent enamel powder and fired in a small oven after each layer of application. Made up of 35 different hues, the vibrant disc is framed by a double track chapter ring, coupled with white gold leaf-shaped hands which are also made by hand. The AdC #4 is once again powered by a heavily hand-modified Omega cal. 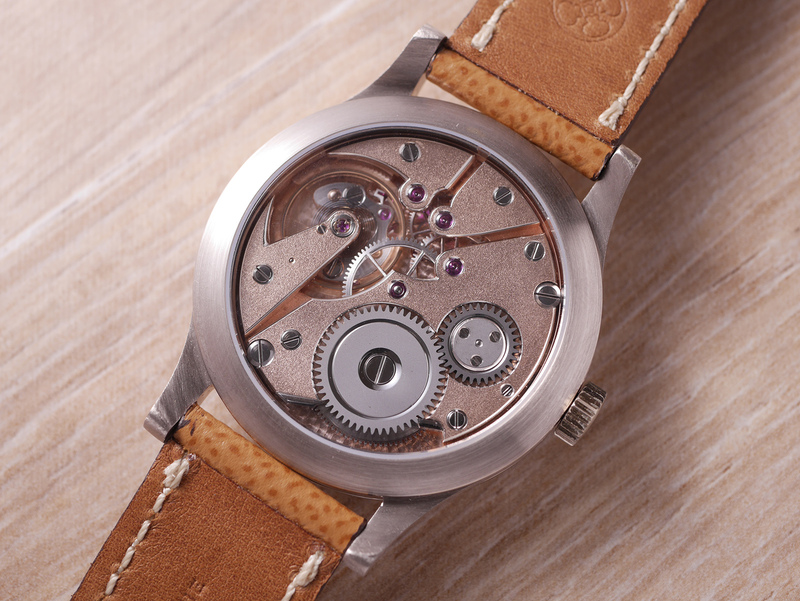 266 with a total of 42 components entirely crafted by watchmaker Moebius Rassmann, and done without the use of CNC milling machines. The in-house components include the free-sprung balance wheel, as well as the winding click, which is made of a single piece of carbon steel, then filed and black polished. It’s extensively decorated by hand, with black polishing on the ratchet and crown wheels, as well as frosting and anglage on the bridges. 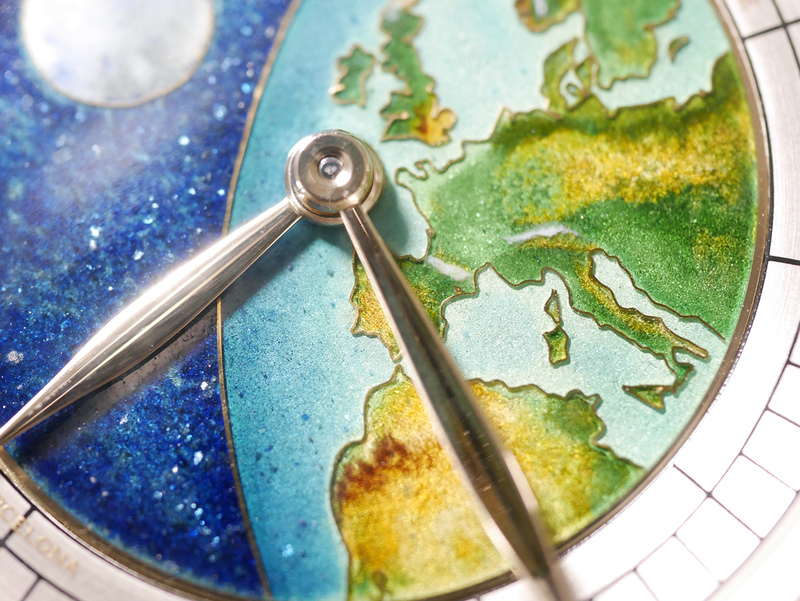 In keeping with the vintage Omega theme, the watch is fashioned in a 37.5mm white gold case with a concave bezel. The AdC #4 is priced at €55,000 before taxes, compared to about €40,000 for the models with standard dials. 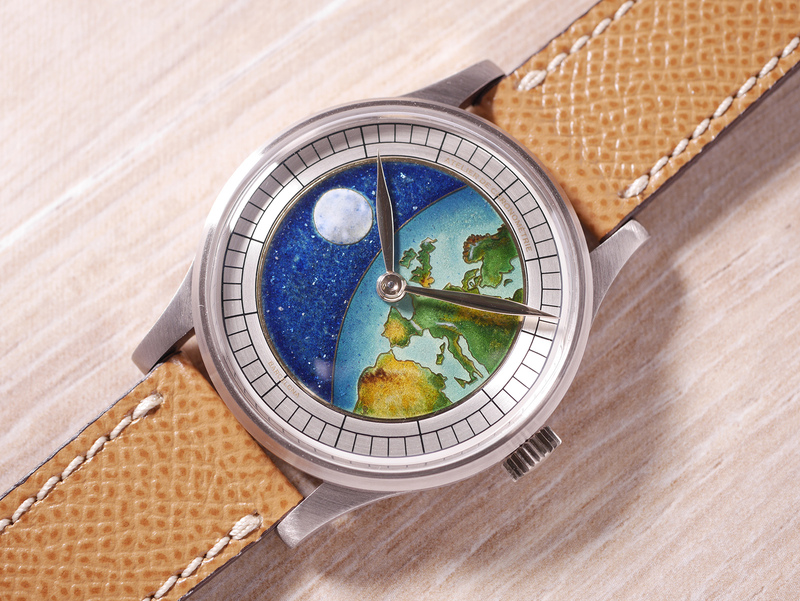 It is available directly from Atelier de Chronometrie. Atelier de Chronométrie is the latest to join the ranks of independent watchmakers specialising in vintage-inspired chronometer wristwatches. The Spanish watchmaker's first timepiece is based on the 1950s Omega calibre 266, entirely reworked and decorated by hand. The Spanish watchmaker broadens its offering while continuing to channel the mid 20th century chronometer spirit. The Spanish watchmaker broadens its offerings of vintage-inspired chronometers powered by historical Omega calibres.